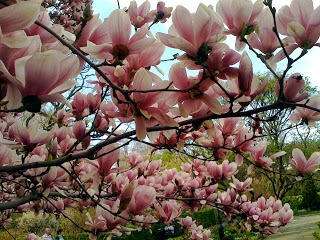 One of my most favourite things is seeing Magnolia trees in bloom. It is a sure sign that Spring is around the corner. I love the white blossoms, but there is something so beautiful about the pink flowers. I love the furled up buds, I love it when they burst open, I even love it when it rains or winds and all the petals flutter down and litter the pavements like confetti. Melbourne still feels a long way away from being warm tonight, but the bitter edge to the wind we’ve been having of late has definitely shifted. It’s supposed to be warmer next week, up to a tropical 19c. I can’t wait. I’m fed up of going to bed fully clothed under a duvet and a blanket.